I am on a journey to provide a way to automate Mandelbulb 3D. My vision is to have a framework in .net that can manipulate Mandelbulb 3D formulas, position, rotation and julia values. This part of the journey has started. In addition to that, I dream of a application that can use this framework to help find interesting fractals. It will be a long journey. However, one that I am keen to at least try. I have completed the development and testing of the Mandelbulb3D automation classes. These allow a .net application to read/write/click on Mandelbulb3D window elements (e.g. 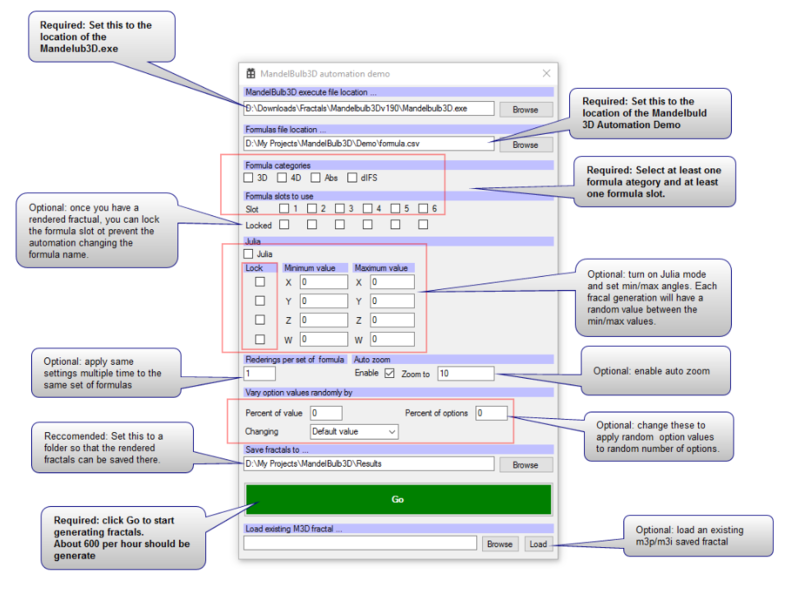 FormulaWindow.setFormulaName("foo"); MainWindow.calculate3Dclick() . Next I need to document the classes and create a demo program ... after that - I'll publish the demo and DLLs for the community to use as they see fit. As a taster of things to come - here is a video of the classes being invoked by an 'automated testing' class. Finally finished the Mandelbulb3D Automation Demo. Both the Demo program (with source) and the MandelBulb3DClasses.dll automation class is ready for people to use as they see fit. Edit: 20170421; removed access to link. This will be shared on request to anyone that wants it. And before any one asks - that 'bing' sound that you'll hear is a side effect of sending formula names into formula slots. You get the same when you do the same manually ... sorry - cannot do anything about it. Does thé programme works on XP please ? It should be x86 compatible. However, when I started the app, after a few rendering steps, it popped up a FileSaveAs dialog for a second, then a msgbox appeared saying Automation failed: Main window not responding. After clicking OK, the app closed, and there was only one new image in the output dir, without param file. I have Win 10 and mb3d 1.9.1. Sorry. I have been away from the forum (and fractal generation) for a while. Life. Cannot walk away from it as much as you want to. I have made a few improvements in the tool (for my own use as the only feedback is yours!). If you are still interested, I'll publish this to see if it helps. Give me a while to dust it off and give it a spin. Once done - a PM will be sent your way with a private link to the new improved version. I'll also personally support you to get this off the ground on your PC (I've recently rebuilt mine so hopefully have a better idea of what might be missing). OK, then send the link to me, too, pls! reinhix2 : I have sent you another link to MandelBulb3DRobot_20170413.1 which hopefully fixes your issue. I sent you a PM also ... however, I cannot see it in my outbox. Saving PMs in the outbox is not a default setting on the forum software. You need to either check the option to save a copy in your outbox underneath the PM editing box before you send it, or set it to save every pm in your outbox in your forum profile settings. Thanks Sockratease. You are correct - I didn't tick that option.